When you walk through the bright, 12-foot floral planter-framed glass doors of The Firm on a hot summer night and make your way to the sprawling all-White Corian front desk longer than many a sailboat, you just know you are someplace special. In fact, you’d be forgiven for thinking you’d just been transported from the edge of downtown Minneapolis to the lobby of a chic boutique hotel just off South Beach. Which might also explain the man in the candy apple red speedo doing high kicks to Miami Sound Machine. Nevertheless, you’re nowhere near Miami. You’re still in Minneapolis at The Firm A Workout Studio. 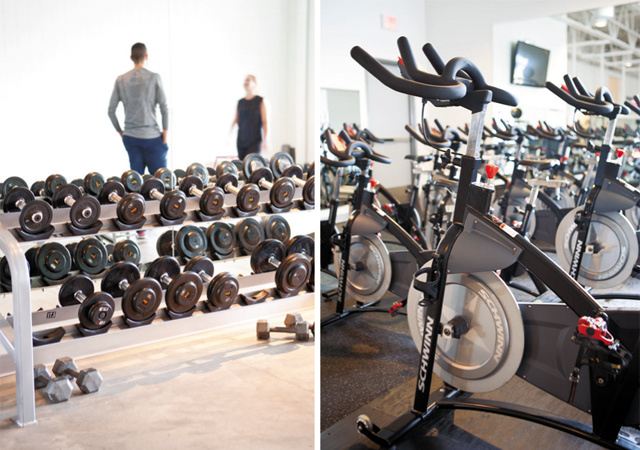 A self-described “five boutique fitness collection,” The Firm is unlike any other gym in the Twin Cities (and, likely, anywhere). Beyond its wide range of classes and oft-legendary instructors, and just underneath the bright lights and neon short shorts, you will find at The Firm a community. A deep reservoir of friendship and joy that is now almost 30 years in the making. Oh, and the guy in the speedo? That’s Doug Melroe. He’ll be teaching your step aerobics class tonight. A successful Firm was not a foregone conclusion in the mid-1980s when Kelly Miyamoto teamed up with two friends to open an aerobics studio in downtown Minneapolis. The trio triumphed over just about every last challenge you could throw at a small business trying to get off the ground. At one point, the entire gym was forced to operate out of the Polish Community Center. Luckily, the spirit of its owners and clients alike has always been larger than any physical space it called home. That is, until its latest incarnation. Today, Kelly and Neil Miyamoto’s Firm finally has a permanent space capable of carrying out its ambitious mission to “make working out an event.” Set back from Glenwood Avenue along a stretch of downtown Minneapolis recently waking from its post-industrial warehouse slumber, the relatively new location is a beautiful oasis for its growing clientele. Most gyms are a means to an end; sterile, impersonal places. You walk in, work out, and leave. The Firm’s communal layout, however, encourages clients to interact and socialize. It’s not the least bit unusual to see friends grabbing a shake after a workout, catching up on the couches or in open areas. Beyond its aesthetic charm, this once aerobics-only outfit has broadened its offerings and amenities to rival many of the larger corporate gyms around town. 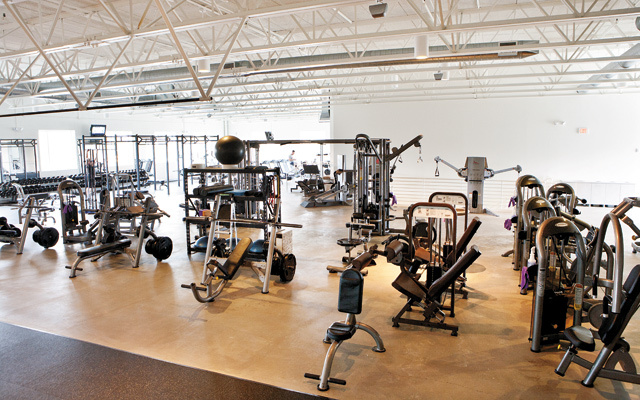 In addition to studio space for a variety of group aerobics and dance classes, The Firm is also home to a complete CrossFit box, stadium-seating cycle studio, heated yoga room, personal training space, and full open exercise area and weight room. If there’s a fitness trend worth paying attention to, there’s probably a class for it at The Firm. Or there will be soon. And you can guarantee that, unlike many of its cookie cutter corporate competitors, the instructors teaching the class will be among the best and most unique in the business. Kelly and Neil have worked hard over the last couple decades to attract talented, one-of-a-kind instructors across a wide range of fitness disciplines. And it shows. Many have achieved relative rockstar status, complete with a dedicated fan following as well as recognition from the fitness community at large. And not just the fitness community either. The Firm has been a strong part of and ally to the GLBT community in the Twin Cities since its founding. Proud supporters of the Minnesota AIDS Walk, the MN Red Ribbon Ride, and Twin Cities Pride for decades, The Firm truly has lived up to its mission of being a welcoming space for all people. Including men in short shorts. On paper and in person, it’s easy to see why, despite its humble beginnings, the Firm in 2014 is a thriving, successful workout community. And a community it is. Beyond any one amenity or popular instructor, the real secret to The Firm’s success is undoubtedly its clientele. There is nothing quite like a member of the Firm. These people love working out. A lot. Some would call them mildly obsessed. And, frankly, they would be right. 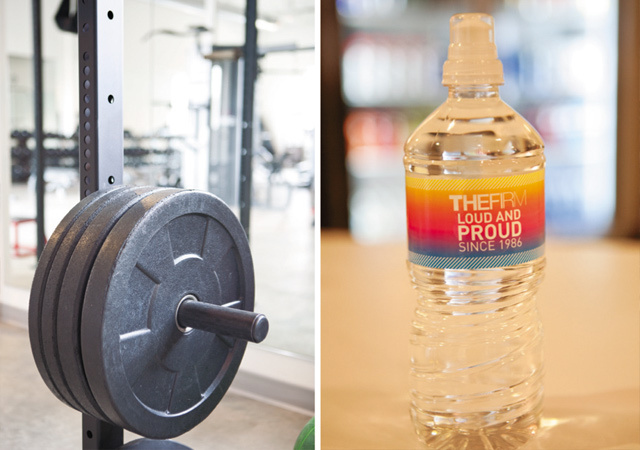 Whether the burn of a great workout or simply the joy of having fun with friends after a hectic workday, Firm members often become evangelists for their gym. If you have a friend who goes to The Firm, you have been or soon will be invited to join them for a workout. That is exactly what happened to me in 2007. A friend joined and suggested I take advantage of The Firm’s free week for new members. A few workouts in and I was hooked. For me, the Firm is also an extension of my family. Quite literally. In 2009, I met my partner in the back row of a step aerobics class. Our mutual love of The Firm led to our mutual love of each other; a surprisingly not-all-too-uncommon experience. I know of more than a couple couples who high-kicked their way to lasting love at The Firm. And that’s the magic of The Firm. You walk in thinking you’re going to get a great workout. And you will. But you’ll get so much more than that, too: fun, friendship, visible abs, maybe even a special someone. There’s no shortage of gyms in this town. If you’re looking for someplace to run on a treadmill at midnight or sit in a steam room or hot tub for hours on end, you know where to go. If, however, you’ve been thinking about shaking things up or setting new goals and you want to have fun in the process, pop down to 1010 2nd Ave N. The smiling faces behind that big beautiful white desk will take great care of you. Including the guy in the candy apple red speedo doing high kicks to Miami Sound Machine.